hunter-1.0.1 is not a library. It's heavily inspired by the excellent ranger, but a little more Emacs-flavoured, and written in Rust to make sure it starts up quickly and to take advantage of its strong guarantees around concurrency. It's so fast I actually built in animations for some parts as a joke, but in fact it turned out to look really nice and makes it look much smoother. YMMV, of course, and this can be disabled. Most things you would expect are implementend, among them tabs, bookmarks (with ranger-import), search/filter, previews of files/directories (including size information in previewed directories), a minibuffer at the bottom with file name completion, multi file selection, etc., etc. There are also a few original ideas, especially around subprocess handling. The process viewer actually shows the output of started subprocesses, their pids and exit codes, notifies on new output and process completion. It's somewhat of a primitive TUI shell. File names are handled using raw OsString, so there is no file it can't handle, no matter what garbage the name contains. 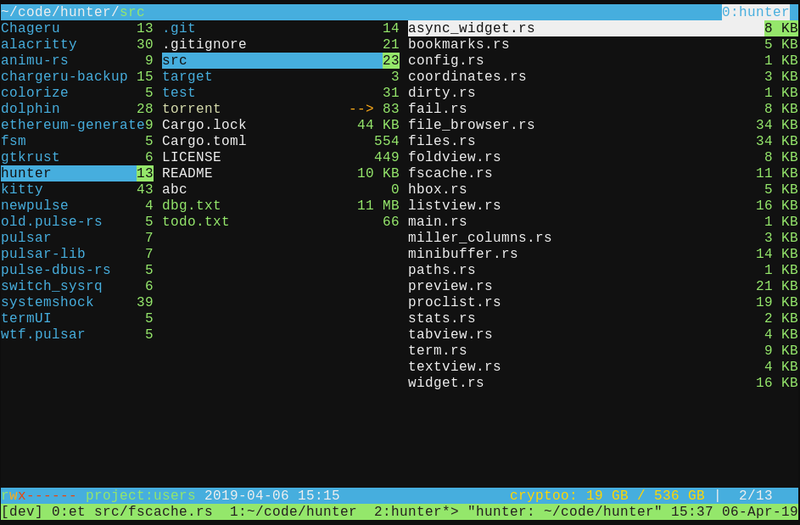 It also sets the tmux/terminal title to the current directory on supported terminals. To speed up the loading of direcories metadata in the preview/backview is only loaded for files you can see, except in the main view. Still, metadata is also loaded asynchronously, so you can sometimes see it updating file listings while browsing through your files. I think this is better than waiting though :). Technically hunter is not a file "manager" itself. It has no built in primitives for file manipulation like delete, rename, move, and so on. Instead it relies on its easy and extensive integration with the standard cli tools to do its job. For that purpose there are various file name/path substitution patterns and an auto-completing for executables you want to run. This is a young project and probably (definitely) has some bugs and edge cases. It hasn't been tested on a lot of terminals, but at least alacritty, kitty and urxvt work fine. It should work on most Unix-flavoured systems supported by Rust, but was only tested on GNU/Linux. I haven't lost any files so far, at least. A big thanks to ranger and its developers. Without its inspiration this wouldn't have been possible. hunter not a drop-in replacement and doesn't cover every use-care, especially if you're into advanced customization, since hunter has basically none unless you modify the code, but if you just need fast above all else it might be a good coice. hunter uses ranger's rifle to open files if rifle is in your $PATH. If it can't find rifle it uses xdg-open. It also uses ranger's scope.sh to generate previews for non-text files. A slightly modified version is included in the "extra" directory. Put it in your $PATH somewhere if you want previews for non-text files. To change the directory of your shell when quitting hunter with Q you need to source extra/hunter_cd.sh, which is a wrapper that runs hunter and checks for ~/.hunter_cwd after hunter exits and cd's into the contained directory if it exists. By default hunter uses emacs style keybindings. If you use a QWERTY-like keyboard layout this is probably not what you want. In that case use the "evil" branch which remaps movement keys to vi-style.